"Even in some of the most benighted places, this magic between teacher and student happens." "Dear teachers and students, dear principals and counselors," begins a column written last August by Samuel G. Freedman, the co-writer of the On Education column for the New York Times. "As the new school year begins, let us reflect. Let us reflect on our reflections about reflecting." Freedman, who espouses a healthy skepticism of education fads and jargon, goes on to skewer the current reverence for reflection in teachers' colleges and K-12 classrooms as "the consecration of emotion and feeling . . . making every teacher and student the unchallenged arbiter of his or her own achievement." Bringing to bear his thirty years of reporting and other experience, Freedman likes to challenge conventional wisdom and, as he puts it, "puncture" overinflated education ideas. Yet a critical eye is only one of two crucial tools he uses to illuminate the kaleidoscope of education nationwide; the second is an open heart. "What you must never forget in education is that you're writing about something magical," he says. "You can't just write about education critically. If you do that -- if you only say what's wrong -- then you're not covering the beat correctly, because even in some of the most troubled, benighted places, this magic between teacher and student happens." The New Jersey native started at the suburban Courier-News, near his hometown, and worked his way to the On Education column via the Times's Metro and Culture sections. 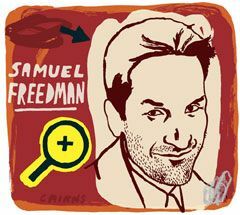 Freedman has taught for fifteen years at the Columbia University Graduate School of Journalism and authored six nonfiction books on topics ranging from education to American Jewry to a black church in Brooklyn. For the column, which he writes biweekly, alternating weeks with Joseph Berger, he travels around the country to report about almost anything that has to do with education, from prekindergarten to graduate school. Embracing that enormous canvas, Freedman strives to keep his subjects balanced between the critical and the upbeat, between K-12 and higher education, between New York City and the rest of the nation. He brings every big issue he addresses down to the level of real individuals, telling the stories of policy, poverty, race, and culture through the experiences of a science teacher, for example, or a seven-year-old student. He wants his readers to understand the issues and buzzwords in education enough to be critical judges themselves, and he also wants them to feel the "magic." "The ultimate experts on anything in education are, to my mind, the pupil, the teacher, and the parent, probably in that order," Freedman says. "In order to really convey what education is about and what's successful and what's not successful, you have to really drill down to those students, teachers, and parents." For instance, one of Freedman's favorite columns, printed in October 2005, described the determination of Muslim football players at Dearborn High School, in Dearborn, Michigan, to maintain their holy fast for Ramadan even while competing for the state playoffs. "Khalil Dabaja at defensive back, Amir Rustom at linebacker, Mohammad Kassab at nose guard, Hassan Cheaib at fullback -- they all have mastered the rhythms of the twin rituals of Islam and the gridiron," he wrote. "It was such a fascinating experience, the collision of an ancient religion that's seen, unfortunately, as sort of an alien one in America, with this quintessential Middle America ritual of high school football," Freedman explains. "I thought it was a real contribution to the public debate, like, 'These guys aren't aliens; these are guys playing high school football. What's more American than that? And, by the way, they're fasting, too.'" When a column of his strikes a chord -- or a nerve -- with readers, Freedman will get seventy, eighty, or even a hundred emails about it. A column in September 2005 about Hurricane Katrina's decimation of an all-black Catholic high school in New Orleans did that. Freedman detailed the experience of an aging ex-music teacher, who, through the fog of senility, didn't understand that he couldn't go back to St. Augustine. Adversity hadn't stopped him before; nearly forty years earlier, when spectators at the elite Mardi Gras Rex parade had hurled bottles and racial slurs at the school marching band, Freedman wrote, "Mr. Hampton kept his students unperturbed, lifting thigh parallel to pavement in their trademark high-stepping style." This time, though, there were no instruments left to play, and no students left to play them. In response to the column, donations poured into the school from readers around the country and an entire Jewish congregation outside Chicago. Influence on school policy, however, is harder to pull than heartstrings; a series of columns in late 2005 and early 2006 about a Brooklyn principal who drove out veteran teachers and punished others for dissent yielded no response from the New York City Department of Education. By repeatedly writing about potent issues, such as the "mad rush" to create small schools, however, Freedman aims at least to inject them into the public debate. In taking strong positions, which he does only on occasion, Freedman draws on personal experience for expertise. He is a teacher (albeit of graduate students) and a parent of two adolescents, and his first book, Small Victories, took him into a Manhattan classroom almost daily for a year. Combining these experiences with decades of covering education off and on, he says, "It's hard for someone to tell me I don't know what I'm talking about." This expertise is essential to navigating the politics and false panaceas that muddy American education. "There's often a kind of false template of liberal/conservative, or Republican/Democrat, put on educational issues," says Freedman. "And I think that it actually works against a really supple, intelligent understanding." For example, when he opposes constructivist math, which he has seen fail for many students, including his own children, critics call the position conservative. He counters, "What's liberal about bad curriculum?" Freedman believes newspaper readers deserve "journalism that explains in clear, accessible language what you don't understand, journalism that takes you into the classroom, journalism that gives you a suitable mix of stories, from the uplifting to the very, very critical, so you feel like you're getting the entire picture." And the entire picture, to his mind, is broad. He calls education a "switchboard" through which flow all the most defining forces in society, such as race, class, religion, and war. Last summer, he spotted an education story in a Barnes & Noble bookstore in New Jersey, where a group of prison inmates scheduled for release soon were taken for "leisure education" to help them make the transition from regimentation to freedom. They looked for books for their children, for books on business and African American culture. After being mistaken for a salesman startled one inmate, he told Freedman, "I'm used to people being scared of me. I've been told I look mean all the time. I was kind of lost today, so maybe I didn't look so mean." Moments like these, when human emotion seeps irrepressibly from heretofore-unnoticed places, are what Freedman would tell his students to stay alert for. "Every policy, finally, is about individuals in schools, and never forget that," he says. "Never lose your ability to be dazzled. Never lose the ability for your heart to be stirred." Grace Rubenstein is a senior producer at Edutopia.